Minister of Fisheries and Agriculture Dr. Mohamed Shainee on Monday refuted allegations that the United Nations (UN) and European Union (EU)'s decision against observing the upcoming Presidential Election was over doubts regarding the election's independence. Speaking to local media Mihaaru about the calls by international organisations on the Maldivian government to ensure independent elections, Dr. Shainee stated that the election will be free and fair without room for anyone to raise doubts. While the government had extended invitations to the UN and Eu to observe, both organisations decided against officially taking part in any aspect of the election. Following the Maldives' exit from the Commonwealth in 2016, the Commonwealth will not be observing the election as well. The UN had offered great assistance during Maldives' first democratic election in 2008 and observed the 2013 election as well. Hence this year's election would be the first without any UN involvement ever since Maldives implemented the new Constitution. According to the Elections Commission (EU), the EU had responded that it had no interest in observing the election this year. In the wake of UN and EU's decision against observing, the opposition parties had raised allegations that their refusal indicated doubts regarding the independence of the election. 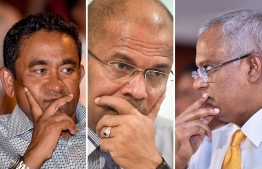 The opposition backed their accusations by warnings issued from foreign bodies to the Maldives. The United States last week had raised concerns about the "continued democratic backsliding in Maldives" ahead of the election slated for September, and warned of "appropriate measures against those individuals who undermine democracy, the rule of law, and a free and fair electoral process". The fisheries minister stated that the UN, as a rule, observed elections in nations that are war-torn or suffering from strife. "We rejoice that the UN has decided not to observe this election. It means that the organisation does not believe the situation in Maldives is the dire picture the opposition has painted." As to why countries like the US are calling for independent elections, Dr. Shainee responded that such calls were based on the false talks and misinformation spread by opposition parties about Maldives. Declaring that the opposition's claims regarding the situation in Maldives were untrue, Dr. Shainee criticised the US for issuing warnings without looking into the truth, saying that such acts also constitute as influencing the election. Dr. Shainee went on to note that despite the UN's noninvolvement in the election, member countries of the organisation will be observing and monitoring. He stated that the government extended as many invitations as possible to ensure that this year's election will be the most transparent and independent one yet. Highlighting the complaints received over actions of the EC that threatened to infringe the voting rights of some people, the minister assured that the electoral watchdog has solved all the issues. Should there be further concerns, Dr. Shainee stated that they could be resolved via the national advisory committee, which comprises of representatives from political parties and related authorities. The minister added that as all the voting procedures, such as casting and counting of ballots, will be done in front of political parties, candidates, observers and monitors, there will not be any chances for election fraud.